A new SPERI report assesses the cost of ‘too much finance’ for the UK from the 1990s to the current period. The UK’s Finance Curse? Costs and Processes suggests that the total cost of lost growth potential for the UK caused by ‘too much finance’ between 1995 and 2015 is in the region of £4,500 billion. This total figure amounts to roughly 2.5 years of the average GDP across the period. The report provides the first ever numerical estimate for the scale of damage caused by the UK’s finance sector growing beyond a useful size. Of the £4,500 billion loss in economic output, £2,700 billion is accounted for by the misallocation of resources where resources, skills and investments are diverted away from more productive non-financial activities into finance. The other £1,800 billion arises from the 2008 banking crisis. The report is by Professor Andrew Baker, Professorial Fellow in Political Economy in SPERI and the Department of Politics at the University of Sheffield; Professor Gerald Epstein, Professor of Economics and Co-Director of the Political Economy Research Institute at the University of Massachusetts Amherst, and Dr Juan Montecino, postdoctoral researcher at the University of Columbia. The data in the report suggests that the UK economy, may have performed much better in overall growth terms if: (a) its financial sector was smaller; (b) if finance was more focused on supporting other areas of the economy, rather than trying to act as a source of wealth generation (extraction) in its own right. 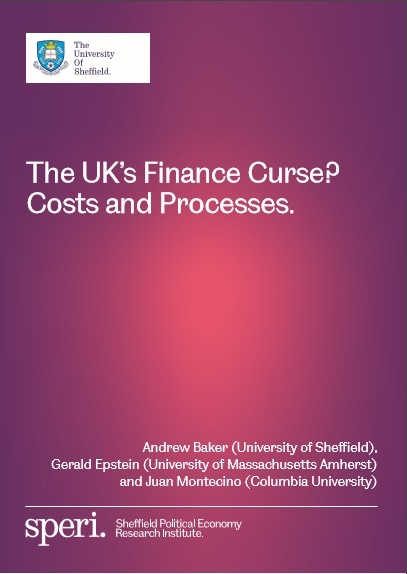 This evidence also provides support for the idea that the UK suffers from a form of ‘finance curse’: a development trajectory of financial over dependence involving a crowding out of other sectors and a skewing of social relations, geography and politics. The authors call for a focused and systematic interdisciplinary research agenda using the finance curse framing to further dig behind the numbers presented in the report. They argue that the report’s findings and ideas should mark the start of a process of more carefully debating and considering the potential social and economic costs of excessive finance in the UK and should be of both interest to researchers and of concern to policy makers. Appendices to accompany the report have also been published.